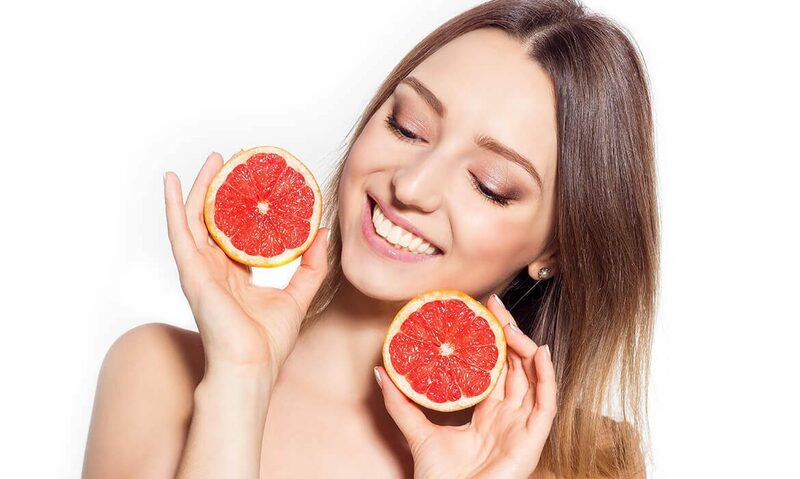 Vitamin C To Boost Collagen and Maintain Healthy Skin! Home/Skincare/Vitamin C To Boost Collagen and Maintain Healthy Skin! Vitamin C is a cofactor in the synthesis of collagen. Collagen, being the most abundant protein found in your body, is present in your skin, bones, tendons, ligaments, cartilage, and blood vessels. Collagen is what provides structural support and strength for your skin. Without adequate levels of collagen, your skin loses firmness and elasticity, and wrinkles begin to appear prematurely. Since collagen production decreases as you age, it’s imperative that you provide your skin adequate nourishment to help facilitate the production of collagen. How Much Vitamin C Should You Consume? Vitamin C, often labeled ascorbic acid or L-ascorbic acid is a vital nutrient found in many foods we consume. Vitamin C is water-soluble (absorbed through water), making it readily available to you. However, your body will not store it, and any excess levels will be eliminated by your body. On the same token, humans are not able to synthesize this vitamin, so it is important to incorporate it in your diet daily to ensure you are getting enough. 90% of the Vitamin C you consume is found in fresh fruits and vegetables. It’s important to note that Vitamin C is sensitive to heat, light, and oxygen, and can become easily damaged, thus decreasing its potency, and potentially rendering it ineffective. To obtain the most Vitamin C content, eat your fruits and vegetables raw. Try and get your fruits and veggies from your local farmer’s market for optimum freshness. And remember, the longer the produce sits in your pantry, the quicker the Vitamin C will oxidize, and the less nutritious your fruits and veggies become. Vitamin C is a powerful antioxidant, capable of neutralizing free radicals that cause cellular “rust” (oxidation). Vitamin C boosts collagen production. Collagen plumps your skin and smooths out fine lines and wrinkles. It also helps your skin maintain suppleness and elasticity. Vitamin C prevents the sun’s harmful rays from causing further damage to your skin. Vitamin C is NOT a sunscreen or sunblock, however, it does help by counteracting those free radicals that are generated during prolonged UV exposure. Vitamin C helps strengthen blood vessels, including the capillaries that are in your face. Improved blood circulation allows more nutrients to be delivered to your cells and contributes to your skin’s radiant glow! Vitamin C is known to reduce inflammatory response in your body. This is especially beneficial to those looking to get some relief from skin conditions such as rosacea or cystic acne. Facial Oil Myths You Have to Stop Believing! 9 Good Habits Girls with Flawless Skin Swear By! Nightly Skincare Rituals You Should Never Skip! What Really Happens to Your Skin When You Drink Alcohol? ✓ Receive Weekly Health & Beauty Tips! ✓ Save 10% Off Your First Order! Copyright 2019 © Lipani Skincare. All Rights Reserved.